The Green Sanctuary: What is Lunula ? The white crescent–shaped area located at the base of fingernails and toenails is known as the lunula. Differences in the shape, form, or color of lunulae can be indicative of injury or a serious health issue, such as a deficiency, infection, or disease. Medical attention should be sought when persistent changes in lunulae, or nail moons, occur. 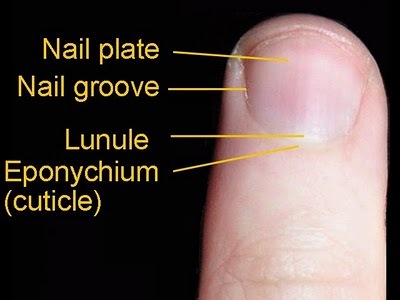 The lunula is the only visible part of the nail matrix, or the living part of the fingernail, and appears white in color. In healthy individuals, lunulae are visible on all larger nails, except on the smallest or pinky. A majority of the nail matrix is positioned underneath and behind the actual nail bed. Responsible for producing the protein keratin, which forms the nail plate, the nail matrix is vulnerable to injury. When the nail is injured, the nail matrix can become damaged resulting in lunula discoloration and hindered nail growth. Lunulae are considered reliable indicators for warning of deficiencies, infection, or disease. Differences in color or shape can denote a condition such as kidney disease, congestive heart failure, and systemic disorders. Traumatic injury, such as a hematoma, can also result in a change in the color or shape of the lunula. A hematoma results from trauma to the nail and manifests as a deep red color caused by trapped blood between the nail bed and plate. 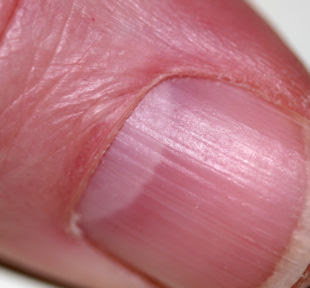 Color anomalies, known as lunular dyschromias, can appear on the nail without an external cause such as injury. Colors with a red or blue tinge can be indicative of heart or lung disease, rheumatoid arthritis, or hypertension. Dark hues such as black, brown, or green can signify conditions such as infection or heavy metal intoxication. More subtle tones such as yellow, gray, or overall paleness can be a sign of conditions such as respiratory illness, vitamin deficiency, or anemia. Formation anomalies, known as lunular dysmorphias, are often characterized as being suddenly visible, oversized, or nonconvexed in shape. A lunula that appears on the little finger can indicative health maladies such as hypertension or circulatory issues. An increase in the size of a nail's lunula, especially on the thumb, can signify an underlying cardiovascular or circulatory condition. Triangular lunula formation is a sign of a rare condition known as nail-patella syndrome (NPS). Nail disorders, such as Beau's lines and koilonychia, are indicative of mineral or nutritional deficiency. Beau's lines is characterized by dark horizontal lines across the nail accented by linear indentations. The disorder is often caused by malnutrition, illness, or trauma to the nail. 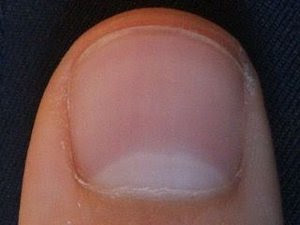 The fingernails of individuals with koilonychia are thin with raised ridges, and, in some cases, may have a concave shape. The development of koilonychia is commonly the result of an anemia caused by an iron deficiency. Bacterial and fungal infections can adversely affect nail appearance, composition, and growth. Pseudomonas, or bacterial infections, manifest as a greenish discoloration of the fingernail and originate either underneath or on the surface of the nail itself. Sustained by dead tissues in the nail plate, these bacterial infections prosper in moist areas such as the nail bed. Fungal infections, also known as yeast infections, affect the nail plate and, when left untreated, result in the separation and shedding of the nail plate from the nail bed. Tinea unguis, referred to as ringworm of the fingernail, is a common fungal infection that causes the nail to thicken resulting in the deformity and loss of the nail plate.